For 2010, I've decided to blog about my monthly online earnings via my Twitter account, and my Personal Blog. I'm posting around twice a week about the same things I would normally blog about, receiving around 100 to 150 unique hits per day. Since these are personal accounts, I have been quite discriminating in my choices of what to "promote". If you are a newbie like me, then read on and join me on this journey! If you are in the same situation, I invite you to share what you know and how your efforts have been fruitful. It took me almost 2 years before I got my first hundred, but still I know some who are taking even longer. I am no expert, but I was lucky, I guess, to stumble upon certain keywords that brought in a lot of visitors. My advise then is to try to different things and monitor your visitors - analyze where they are coming from and try to cater to their needs without losing yourself in the process. It's still a personal blog after all! Chitika -$0.56 - Still nothing is happening. Maybe my search engine visitors are not interested. :p If anyone has any idea how to improve this - let me know! 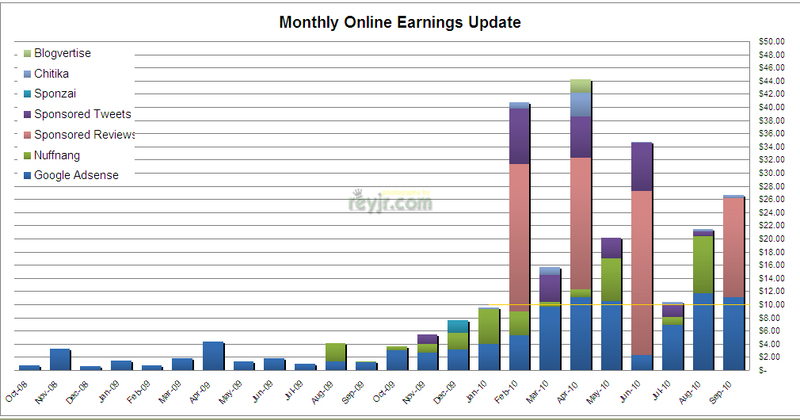 From January to September 2010, I have collected a total of aound $223.00 (roughly Php10,500.00 in 9 months). That's an average of about Php 1,180 per month in 2010. Hey, that covers more than my twice a week Starbucks fix! :D Haha.